Tottenham, Liverpool and Everton players appear to be the best picks for fantasy football managers in Gameweek 15. We've looked at players worth considering for the Fantasy Premier League and Sky Sports Fantasy Football competitions - the latter you can change captain for each game day, which adds extra significance each game day. Tottenham entertain out-of-form Southampton at Wembley, while Liverpool travel to struggling Burnley. Here's five players to consider for Gameweek 15. This seems one of the most obvious decisions of the fantasy football season so far as Tottenham host struggling Southampton on Wednesday. Kane got his eighth goal of the season in Spurs' 4-2 defeat at Arsenal on Sunday. You could easily see Kane scoring once, twice or more against the Saints. He costs £12.3m in FPL and £13m in Sky and has 73 and 82 points respectively this season. Cheaper Tottenham attacking options include Dele Alli, Christian Eriksen and Son Heung-min. Glenn Murray is Brighton's top-scorer with seven Premier League goals this season - and is also the club's top points scorer in both FPL and Sky Sports. 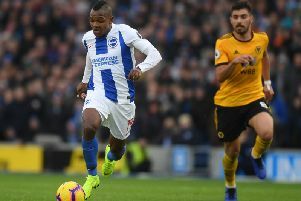 The Seagulls host arch rivals Crystal Palace - one of Murray's former clubs - on Tuesday and the forward will be fresh for the fixture after only coming on as a late substitute in Brighton's 2-1 win at Huddersfield on Saturday. The 35-year-old striker scored twice in three matches against Palace last season, in the FA Cup and in the league at Selhurst Park. He has six goals in six home matches this season. The club's penalty taker as well, Murray will be looking to add to his goal tally. He has 60 points in FPL and 66 in Sky this season and costs £6.7m and £9.6m respectively. Everton host Newcastle on Wednesday and the Toffess go into the match searching for a fifth successive home league win. Sigurdsson has starred for Everton this season and is the club's top points scorer in both FPL and Sky Sports after netting six goals and providing two assists this season. He got the only goal when Everton beat Cardiff in their last match at Goodison Park and will be looking to pull the strings again against Newcastle, with the Toffees looking to bounce back from their late derby defeat at Liverpool. He costs £7.4m in FPL and £9.1 Sky and has returned 74 and 82 points respectively this season. Richarlison is another Everton player worth considering. The Brazilian has netted six goals since his summer move from Watford. Bournemouth will hope to turn their fortunes around when they host Huddersfield on Tuesday evening. The Cherries have lost four successive games after a 3-1 defeat at Manchester City on Saturday. Although the Terriers are in decent form themselves with seven points from their last four matches, Bournemouth will fancy their chances of returning to winning ways at home. Josh King returned to the side last weekend and scored in their 2-1 defeat to Arsenal. Also the club's penalty taker, the Norway international will be hoping to add to his five goals so far this season. King costs £6.3m in FPL and £9.3m in Sky and has picked up 55 and 56 points respectively this season. Another Bournemouth player worth considering is winger David Brooks. A cheap option at just £5.1m in FPL and £6.3m in Sky, he has scored three goals and got one assist to return 46 and 47 points respectively this season. The Liverpool left-back has starred this season to help the Reds collect nine clean sheets in the Premier League so far. Also a threat going forward, Robertson has provided three assists. He costs £6.5m in FPL and £9m in Sky but has already picked up 84 and 96 points respectively this season. With a trip to struggling Burnley on Wednesday, Liverpool will hope to keep the pressure on leaders Manchester City and pick up their tenth clean sheet of the season. Another Liverpool option is Trent Alexander-Arnold, who is cheaper at £5.2m and £8.4m in FPL and Sky. He has returned 71 and 80 points respectively after helping the Reds keep seven clean sheets in the 12 matches he has started.